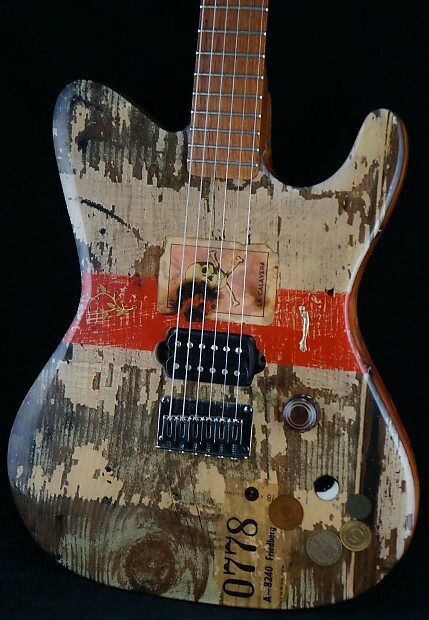 Here is a preowned Michael Spalt Totem Series guitar from the year 2000. 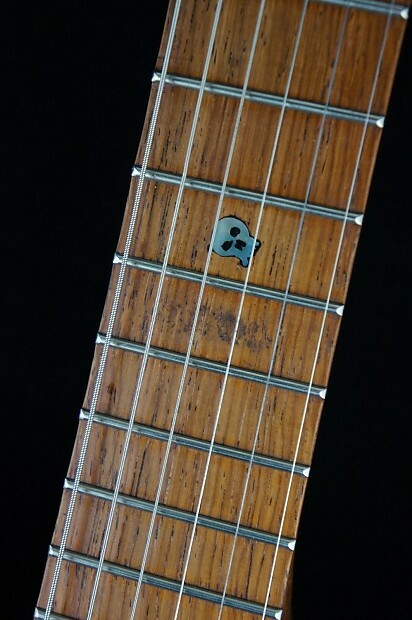 This Totem ResinTop ser# G0007 named “La Calavera”, features a Flame Meranti body with a solid Rosewood neck, 25 ½” scale, 6150 frets, Sperzel non-locking tuners, hard tail bridge, recessed Dunlop strap locks, & a Seymour Duncan ’59 pickup. Controls are; Master volume with a push/pull pot to split the humbucker. 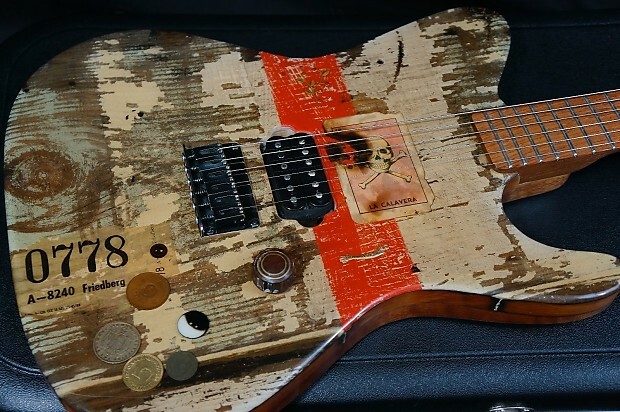 This Spalt guitar has been in one person’s collection for the past 14 years. 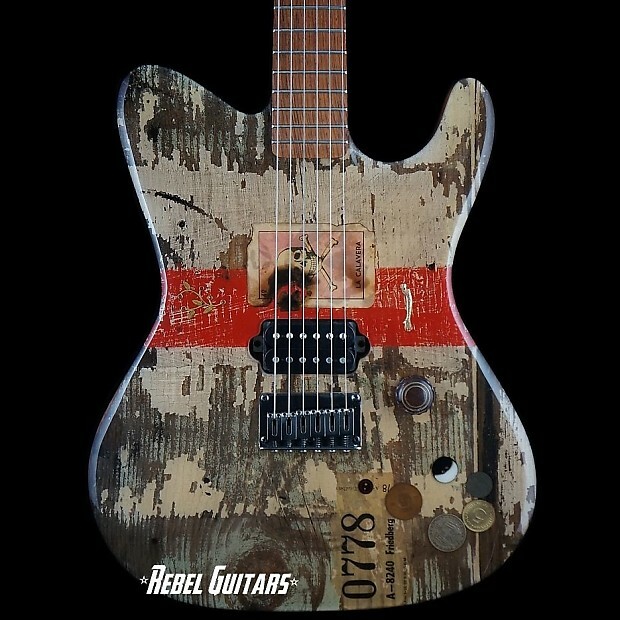 Rebel-Guitars is an authorized dealer for Michael Spalt Guitars. Have a question? Give us a call between 10am & 7pm Central time at 256-872-5577. 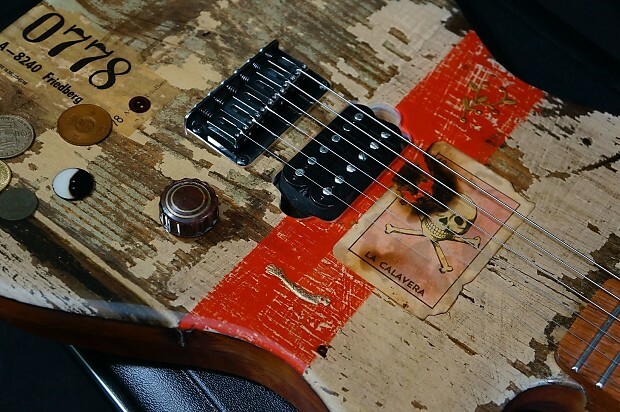 The Michael Spalt “ResinTop” guitars a unique process marrying a tonewood back with a clear resin coating on the top into which decorations and inclusions can be applied. 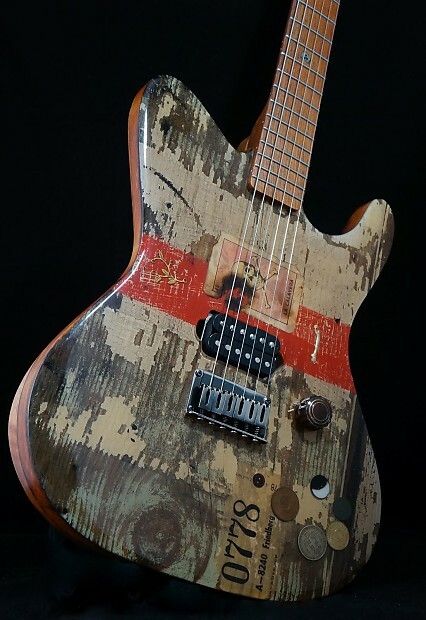 After experimenting with various types of resin, Michael developed this process, allowing him to assemble objects and assorted bric-a-brac into a homogenous guitar body. The resin is formulated to accomodate the thermal expansion and contraction of the wood and it is sonically transparent. 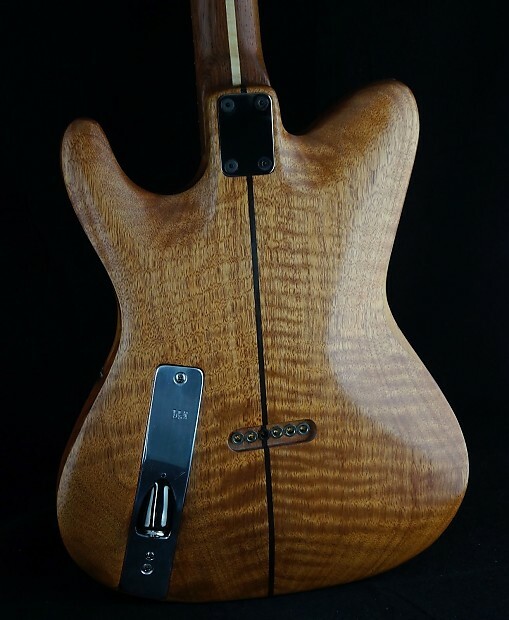 The wood used for the back supplies the basic tonal characterstics and structural stability, while the wood choices for the neck allows to dial in the coloration of the sound. 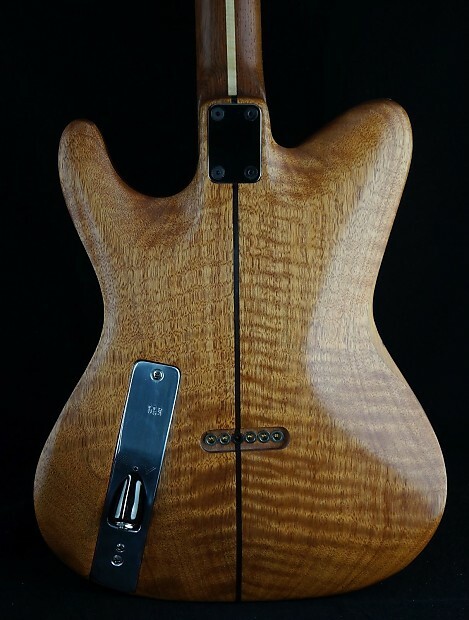 The resin adds sustain and its tonal effect is similar to a “maple cap over mahogany body” effect-sparkle and transparency in the upper frequency ranges. 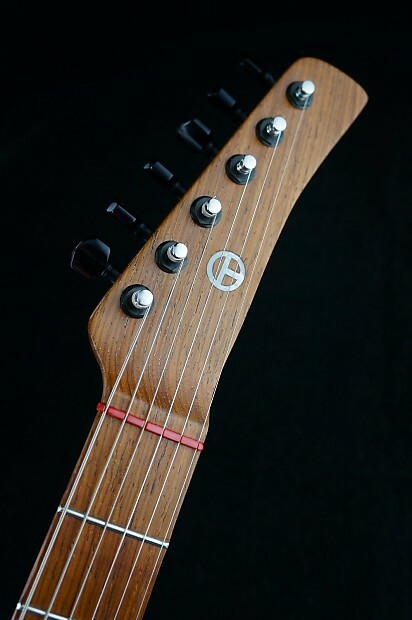 As with a conventional guitar the choice of hardware and pickups also plays a large role in determining the sound of the instrument. 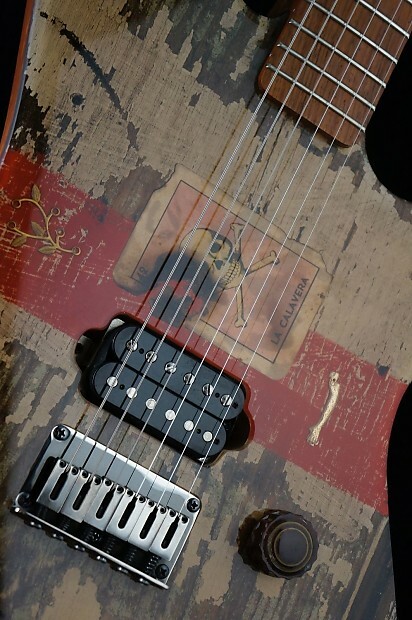 Each ResinTop Totem guitar is a unique instrument, both tonally and aesthetically. I package well and ship fast. Please check out all my other listings. Email me for further questions. Don't miss out!!! Buyer pays 60.00 shipping/handling, 85.00 to CAN, 155.00 to the rest of the World. Paypal payments are expected within 3 days. Check out my other listings. UPS Ground or USPS Priority Mail is normally used for all Domestic Shipping, $60.00 for guitars, amps vary by weight. Faster service, including overnight, is available upon request. 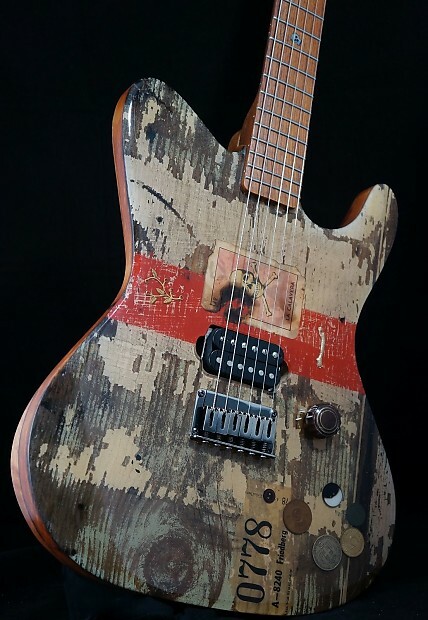 USPS International Priority is used exclusively for International Shipping, $85.00 to Canada and $155.00 Worldwide for guitars. Call for International shipping of amps. International Customers please note: Any additional fees including duties, VAT or any other charges related to international shipping are the responsibility of the purchaser & are non-refundable. All Shipping is at the expense of the buyer. When shipping instruments in for trade, if you are not familiar with shipping requirements/procedures, call for proper packing instructions.